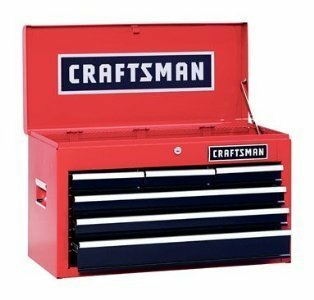 Craftsman is a very reputable, trusted, and high-quality brand name without a doubt. These guys have been around for a long time and will be around for a long time to come. 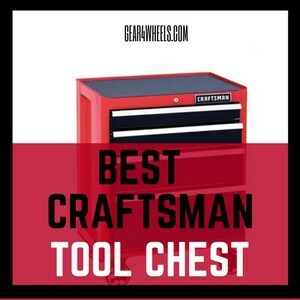 Today we are here to look at some options, all of which are top contenders for the title of best Craftsman tool chest. The Craftsman 4 Drawer Heavy Duty Rolling Bottom Tool Cabinet is a really great option to go with for at home tool storage of epic proportions. This is a very heavy duty bottom tool cabinet from the trusted brand name of Craftsman that we all know and love. This Craftsman Cabinet is made with heavy-duty steel. We like this because it helps add to the fact that it really is extremely durable. It has a very high weight capacity of 650 pounds, it can hold a lot of tools, and take a whole lot of beating too. Sometimes there is just nothing better than good old steel. 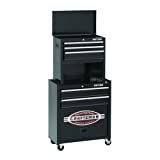 The Craftsman 4 Drawer Heavy Duty Rolling Bottom Tool Cabinet has a total of 4 drawers that are on ball bearing slide systems for a smooth glide. There are 2 smaller top drawers, 1 middle drawer of medium size, and a large drawer on the bottom. It has a drawer for all of your stuff, whether small part, hand tools, or larger power tools too. It comes with wheels that for some mobility, plus they lock so the cabinet does not roll all over the place by itself while you are at work. 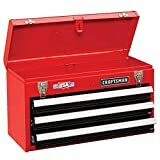 The Craftsman 4 Drawer Heavy Duty Rolling Bottom Tool Cabinet does come with keyed locking system so nobody can get their thieving hands on your tools. 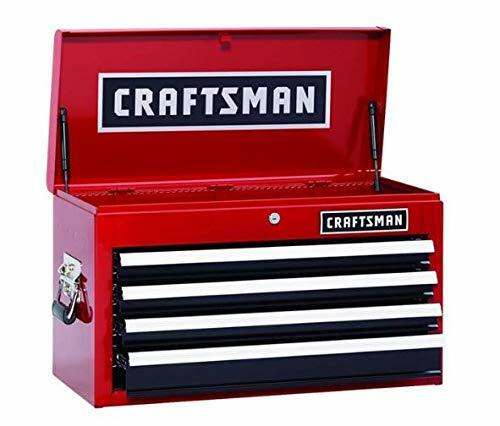 Craftsman has definitely not failed to deliver another high quality product with this particular Craftsman 6 Drawer Heavy Duty Top Tool Chest. This is a great top chest that can be put on a bottom rolling cabinet. It’s made with heavy duty steel, has good storage space, and overall useful build. The Craftsman 6 Drawer Heavy Duty Top Tool Chest comes with a good amount of space under the lid, plus it also has a total of 6 drawers. It has 3 small drawers side by side on the top, 2 medium drawers under each other in the middle, and 1 larger drawer on the bottom. It’s a good option for organizing various sizes of tools and parts, from nuts and bolts to power drills too. The drawers are all set on smooth glide ball bearing systems for easy opening and closing. On the same note, the drawers feature a keyed locking system to make sure that no one borrows your tools without asking. The Craftsman 6 Drawer Heavy Duty Top Tool Chest is made with heavy-duty steel, one of the best materials around for this kind of thing. It won’t dent, bend, or scratch like so many other tool chests too. The recessed aluminum side handles make it easy to carry from one spot to another. 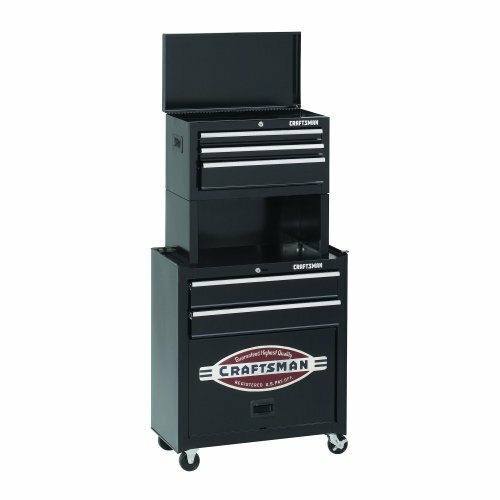 If you need a good tool chest and cabinet combo that is mobile, durable, and has plenty of room, this high-end option from craftsman might just be your best bet. This is a combination top tool chest and bottom rolling cabinet with a heavy duty build, lots of room, and more. The Craftsman Tool Chest Center is definitely a good option to go with if you need lots of tool storage space for at home or in the garage. It comes with a top tool chest with 2 small drawers, 1 medium drawer, and some space under the lid too. It’s a good option for organizing your small tools and parts. Underneath the chest is a tool cabinet. This tool cabinet has one medium drawer on top and a super large, oversized drawer on the bottom. It’s a great option for all of your large items and power tools as well. Tons of storage space is definitely a big factor when it comes to the Craftsman Tool Chest Center. On a side note, all of the drawers are on ball bearing slides to make sure that they open and close very smoothly. 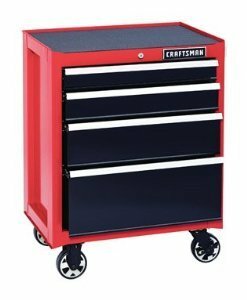 The Craftsman Tool Chest Center is made with high-quality steel in order to ensure a very high level of durability. Denting, chipping, or breaking is not something that this bad boy will readily do. It does come with wheels on the bottom for ultimate mobility. One of the wheels does lock so you can be sure that this Craftsman tool chest and cabinet combo does not roll all over the place. Speaking of locks, the drawers have a key lock for added security. 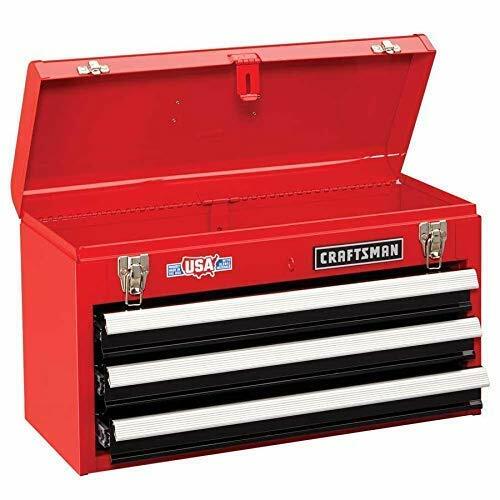 If you need a small tool chest to go with for fewer tools and parts, this high-quality option from Craftsman 4 drawer chest is definitely a good bet to go with. A small tool chest ideal for small hand tools, parts, and for being on the go. This is a very simple yet effective tool chest to have in your arsenal. It may not be huge, but it is more than ideal for storing all of your smaller tools and parts at home. The fact that it is not too large does make it a good option for being on the go and travelling to jobsites, but that being said, it does not have any kind of carrying handles. It does come with a slot, so you can fit a padlock to keep your tools safe. The Craftsman 4 Drawer Chest is made with durable heavy-duty steel to make sure that it does not break, chip, scratch, or dent. It is a good option to go with if you need a small tool chest that is going to last for a long time. It does come with 4 drawers, all of which are the same size. They are fairly small, making them ideal for organizing small tools and parts, but you definitely won’t be fitting any power tools into this thing. The drawers are fitted on reliable stainless steel slides. This tool chest is actually very similar to the previous one, with the exception that it has 3 drawers instead of 4. A small tool chest ideal for small hand tools, parts, and for being on the go. Comes with 3 drawers. Just like the previous one we looked at, this tool chest is very simple, but effective. It’s a small and lightweight chest, making it quite portable and good for being on the go. It is made with durable steel in order to ensure optimal longevity. It comes with 3 small drawers and some space under the lid, all of which are ideal for organizing some small tools and parts. The drawers are fitted on stainless steel slides for smooth operation. The lid of the Craftsman 3-Drawer Metal Portable Chest can be locked with a padlock too. The only difference between this one and the previous one is 1 drawer. When it comes to the best Craftsman tool chest, all of the above options are top contenders, but we would recommend the Craftsman Cabinet above all else.